Asian Live offers new Indian menu by our Indian chef, Mr. Shovan Das who is preparing simple, yet modern Indian dishes at the COEX InterContinental Seoul. Those who love Indian food will be pleased to hear that Mr. Das will be using healthy spices and preparing traditional tandoori and curries for their dining pleasure. 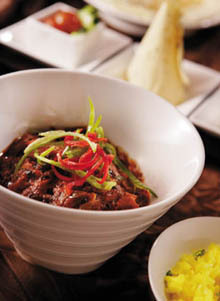 Indian cuisine is beloved the world over for its unique taste and Korea is no exception. Mr. Das has plans to create tandoori made with fish and seafood, spiced lamb, and healthy curries. Guests can enjoy exotically spiced entree, dal makahani, which is a delicate blend of black beans and red kidney beans in a creamy tomato sauce. Its mouth-watering aroma is enhanced with cumin and fenugreek, introduced at the very end. Of note is that the one of the unique lamb chop preparation barbequed in Tandoori (clay oven) and served with lentils and Indian bread as accompaniment to the entree. Jheenga palak is the for both non-vegetarian and vegetarian lovers has been prepared keeping in mind the high nutrient value of spinach. This cuisine is popular because it offers a delicious low-fat alternative. In addition, guests will enjoy samosa which is a common appetizer and a snack in India which is one of the most popular dish in the Indian cuisine all over the world. AsIan Live is already widely known for the authenticity and variety of Asian cuisine available there at the COEX InterContinental Seoul. Guests can choose their favorites from Korean, Japanese, Chinese and Indian menu items and enjoy them at one table.